Because of this problem being awarded the 2nd-Prize, it’s this 1903 reference which is almost universally used when citing the problem. It’s not correct though, as the problem actually was first published the year before, as a candidate problem. White mates in two moves, against any defence (by D.T. 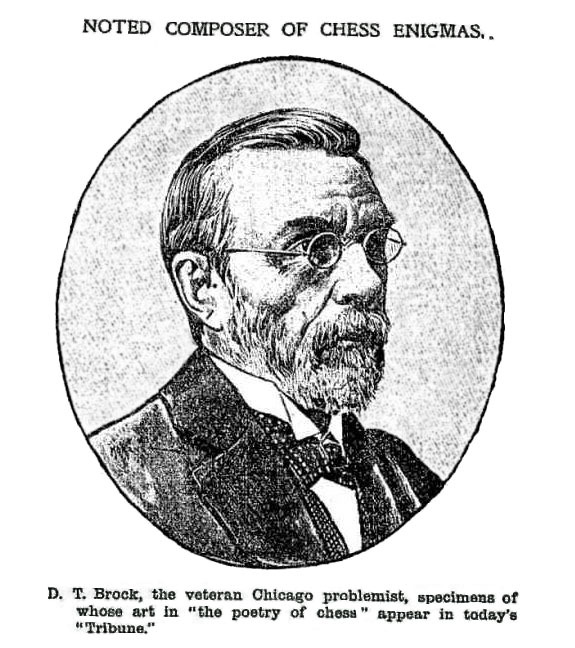 Brock, 1903). 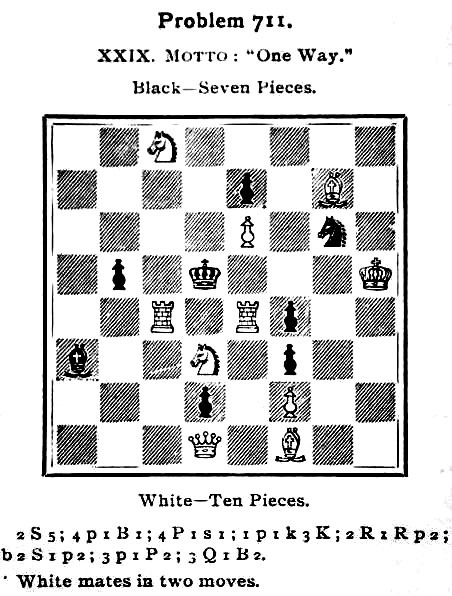 White is five pieces up and the black king has no legal moves, but this is an interesting test of your solving skills, with an imaginative key. Solution, back page. “Literary Digest.”—The subjoined position, which strikes us as an admirable problem of its kind, was awarded second prize. We feel sure that there are not a few who prefer it to the two-er by J. Van Dyk, which took premier honours. 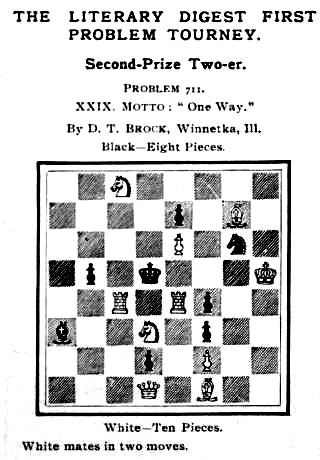 By D. T. Brock, Winnetka.— White: K at K R 5, Q at Q sq, Rs at K 4 and Q B 4, Bs at K Kt 7 and B sq, Kts at Q 3 and Q B 8, Ps at K B 2 and K 6. Black: K at Q 4, B at Q R 6, Kt at K Kt 3, Ps at K B s, 6, K 2, Q 7 and Q Kt 4. Mate in two. That lead made it easy to find this: http://chesscomposers.blogspot.com/2012/08/august-6th.html, wherein his dob is given as 1918 (but I’ve see 1918?? also). But note, they also use the 1903 date for the problem citation (which again, is the prize date, not the composition’s date).